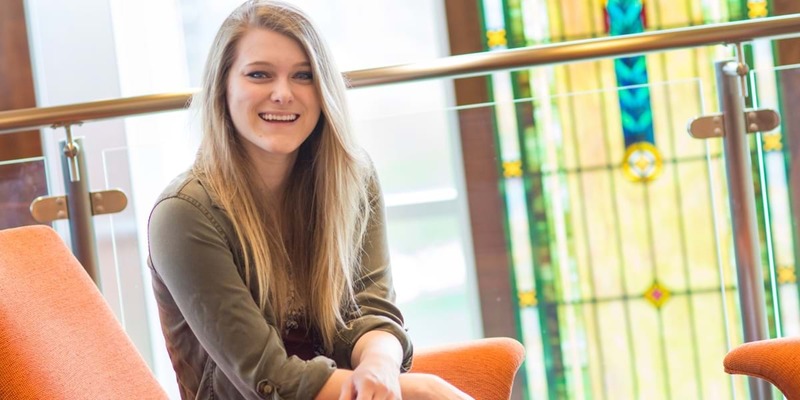 Erica was looking for a college where she could grow in her faith—both in the classroom and in the dorm room—and she found that at Northwestern. She appreciates Northwestern’s thriving community and says that even when she was visiting, she could tell this was home. A music education major concentrating in secondary vocal education, Erica hopes to become a high school choir director after graduation. She’d also like to pursue a master’s degree and conduct a college or university choir. At Northwestern, Erica is involved in several music ensembles and intramural sports. Because of my love for music, I knew I wanted to be involved in it when I got to college. However, I hadn’t considered pursuing it as a major until my junior year of high school. I was leading sectionals in choir, and the substitute teacher mentioned that I should look into teaching music as a career. Looking back, I’m grateful for her words since I now get to cultivate my passion for music every day. I really appreciate how the music department professors build relationships with each of their students. They’re not concerned with just how we’re doing within the department. They want to get to know us beyond our involvement in music, and that’s something that drew me to this place. I would also consider the size of the music department to be an asset. I really like how we have our own community among the ensembles. The majority of my time is spent in the music hall, and it’s really awesome to connect with the people who come through there. I’ve made lots of great memories here, but my favorite memories come from the choir and band tours. When we aren’t performing, we have the chance to do things like go spelunking and visit Niagara Falls. It’s also fun to hang out with my peers outside of the classroom. Even the bus rides were entertaining every now and then! Tours are definitely something I’ll keep looking forward to while I’m here. During my time at Northwestern, I’ve gained a sense of belonging. My favorite part about the people I’ve met here is how intentional they are when they interact with me. I know I’ve made lifelong friendships here because of how deep those connections are.